As most of you know,I'm addicted to change and organization. I felt like my makeup storage needed a facelift,since my collection is growing rapidly and I feel like I'm running out of room. I often wonder if one day I'll be featured on the show Hoarders,LOL. I searched online for awhile,and debated between this and this mobile drawers and the IKEA Alex drawers. 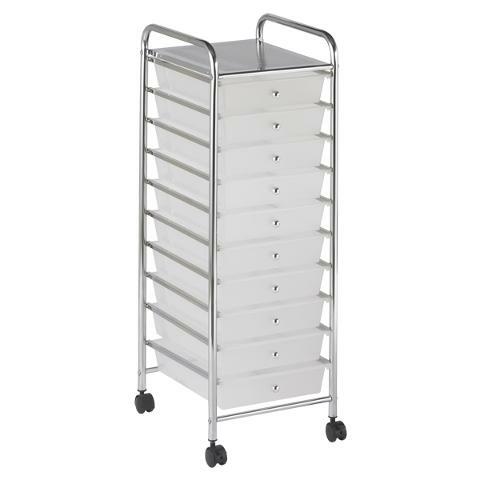 I like the fact that you can move this around,and when I do client's makeup at my house,it would make reaching products more convenient. It took my boyfriend and I about 20 minutes to put this together.It's a quite simple assembly. This was about $45 including shipping. It says it's white,but it's more of a translucent color to me,which I like. I will be posting pictures of what I store in it soon. You can purchase this here..
What kind of storage do you keep your makeup in?